Penelope was found as a stray late winter starving and neglected, and was diagnosed with a severe case of heart worm. Fortunately, Penelope has responded well to treatment and is heartworm free! She is now at Wags Inn patiently waiting for her new family. She is a sweet girl who loves to go on walks and lounge on the couch. She does prefer to be the only dog in the household. Come meet this big love bug to see if she could be your perfect match! Download the adoption application. 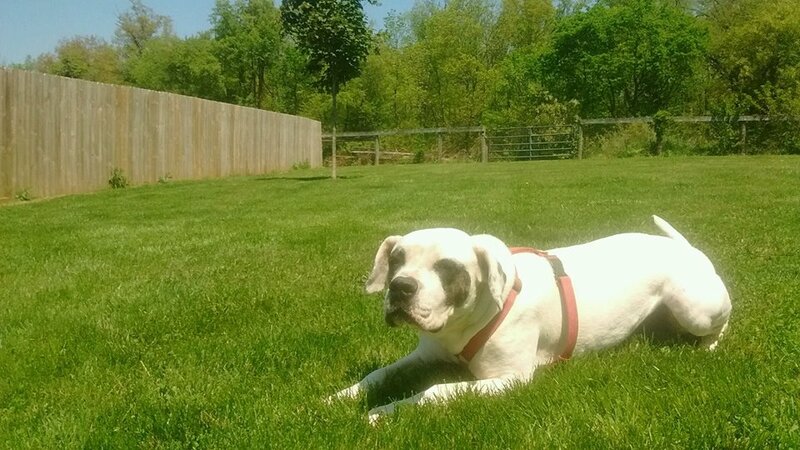 This entry was posted in Rescues for Adoption and tagged adopt, american bulldog, penelope, rescue, white. Bookmark the permalink. I just wanted to say "Thank you" for taking such good care of Mikey for me. Every time I pick him up he looks and feels great. Before I discovered Wags Inn, it was always a source of great anxiety anytime I had to leave town. Now, it is no problem! You have a great staff and business going on over there. Thank you again for treating my dog like he was your own!